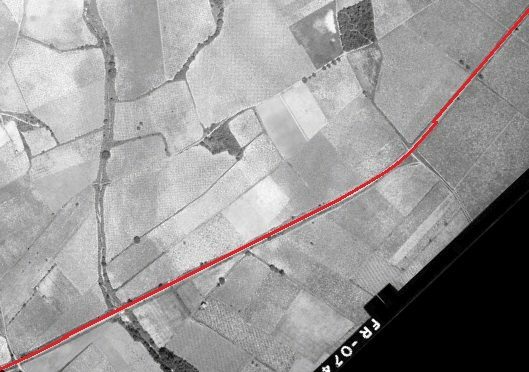 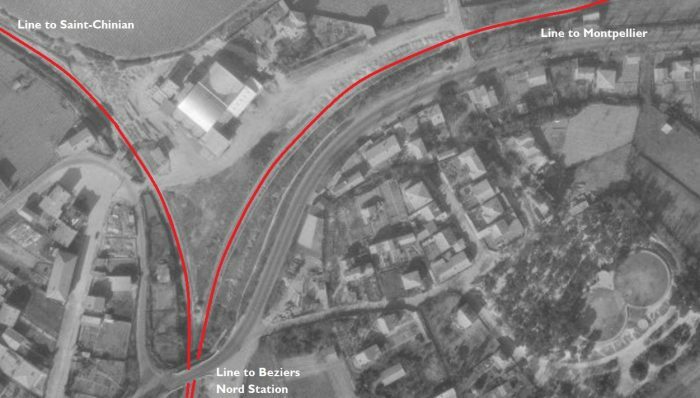 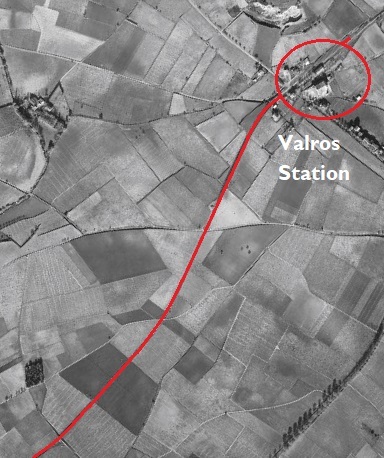 The line soon turned away to the North as shown on the adjacent aerial images from the early 1950s. 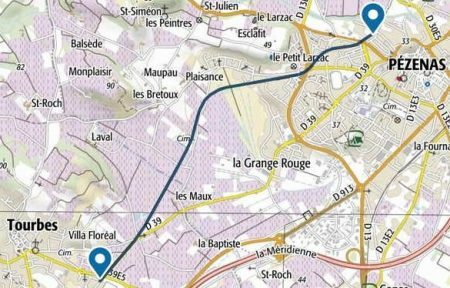 The route follows what is now the Boulevard du Languedoc. 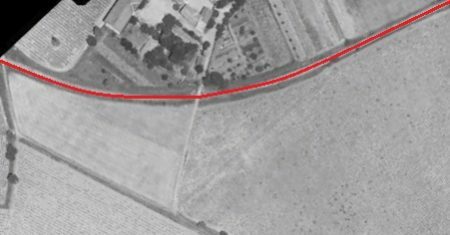 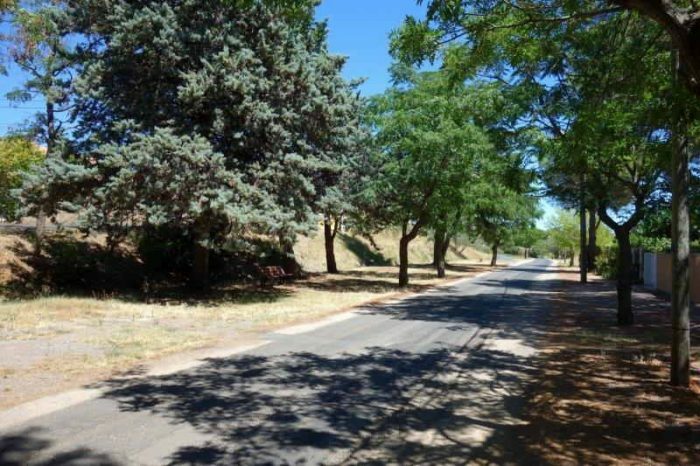 Two modern pictures of the road from July 2018 are shown below. 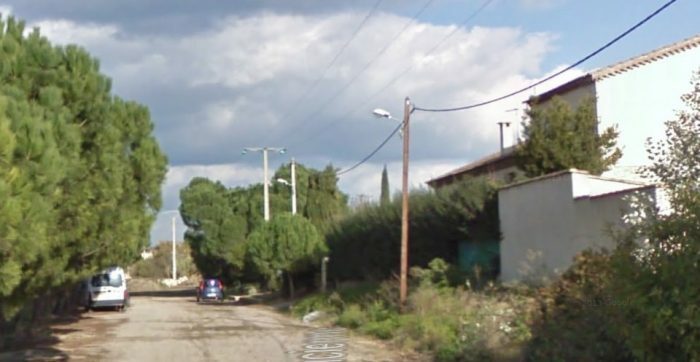 Boulevard du Languedoc. 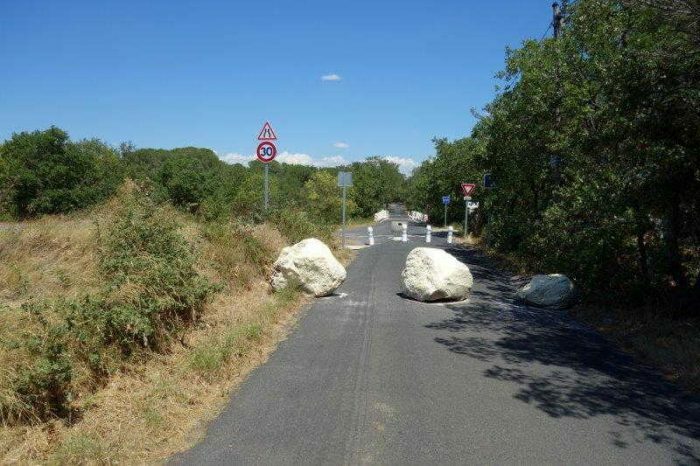 Further along Boulevard du Languedoc. 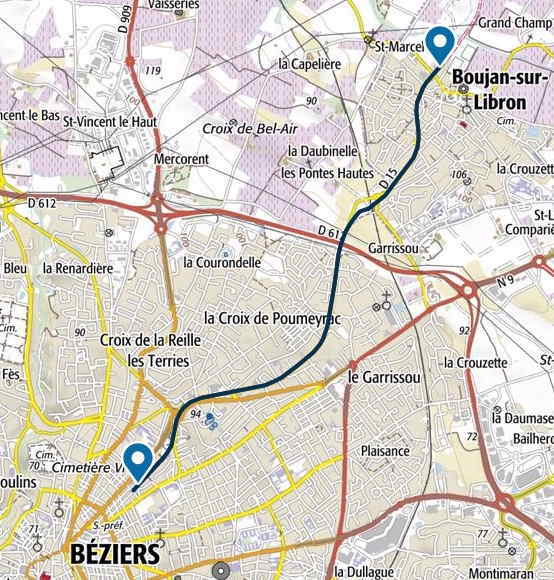 The secondary line crossed the single-track line running North from Beziers Midi Station through Bedarieux and on beyond Millau. 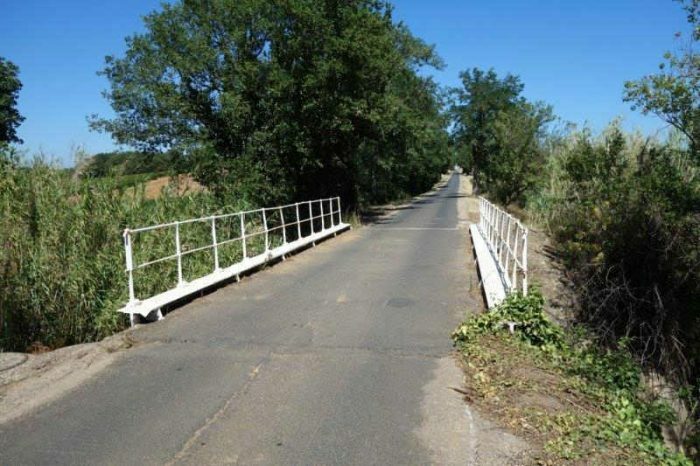 The bridge is now gone but it was a very short distance north of the old road bridge. 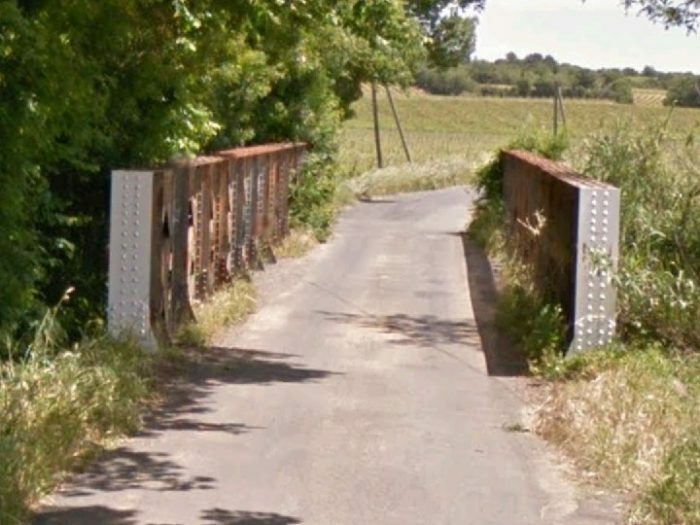 The original road bridge as seen in Google Streetview from the modern road bridge below. 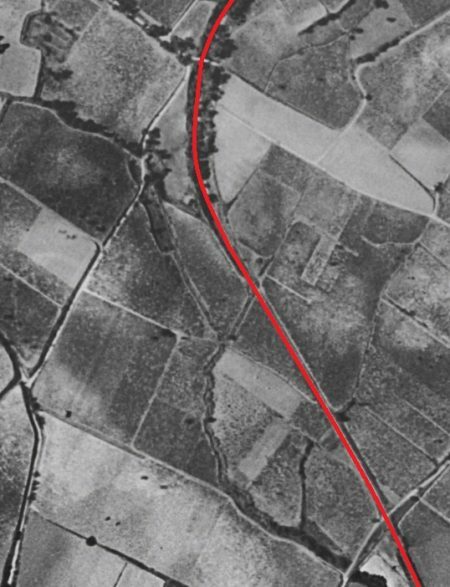 The old railway route crossed the line between the modern and older road bridges as shown on the map above. 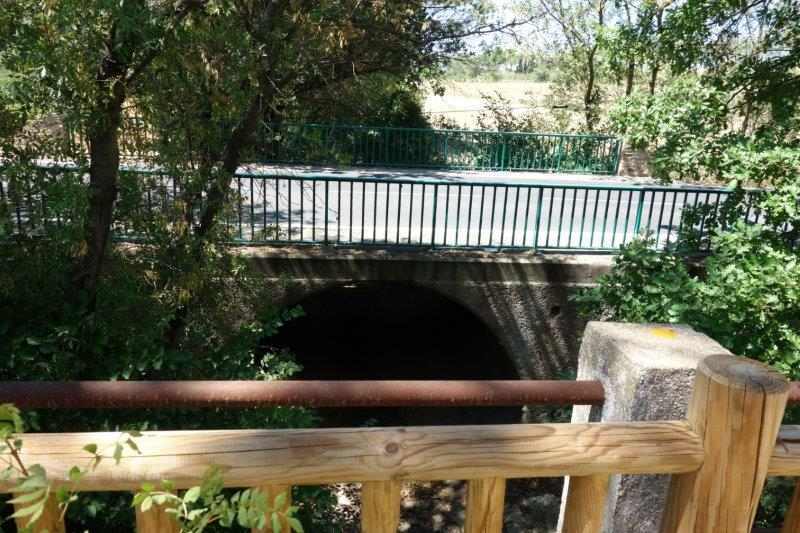 The modern road bridge is seen from road-level above. 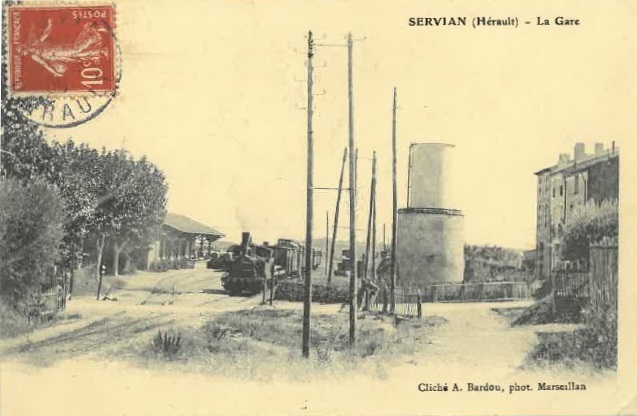 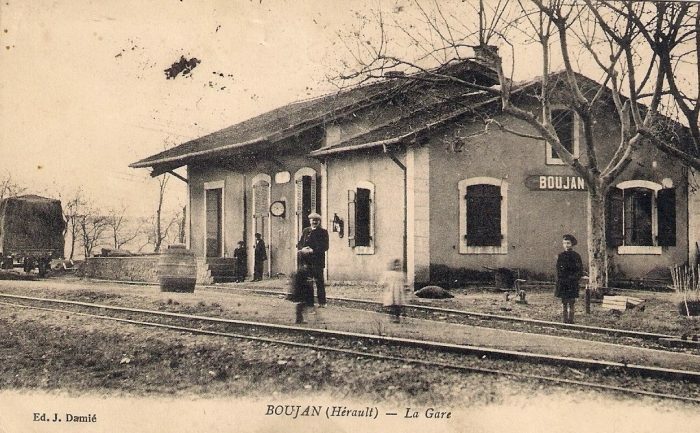 The Station at Boujan-sur-Libron was situated close to the Co-operative building in the village. 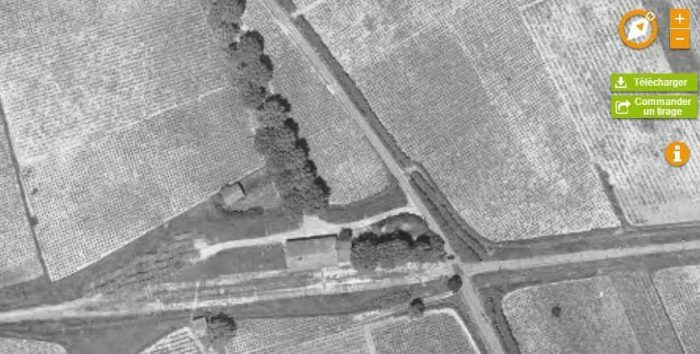 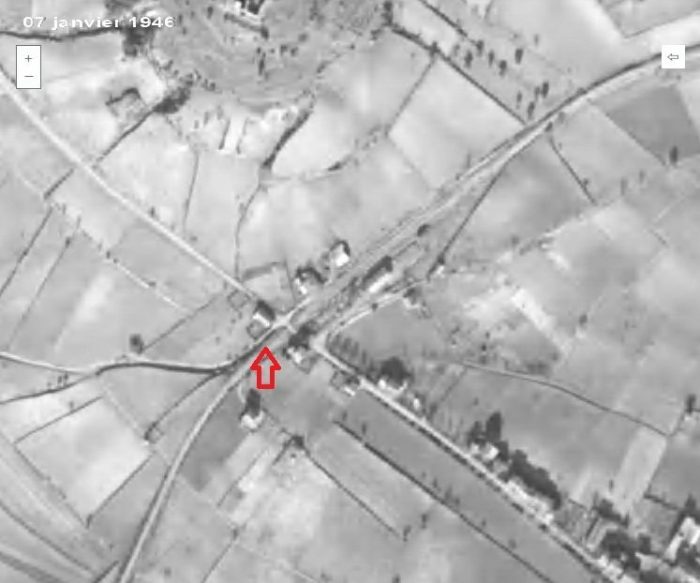 The aerial image of the site from the early 1960s is not of the highest quality but it does show the relative positions of the Co-op building and the station building. 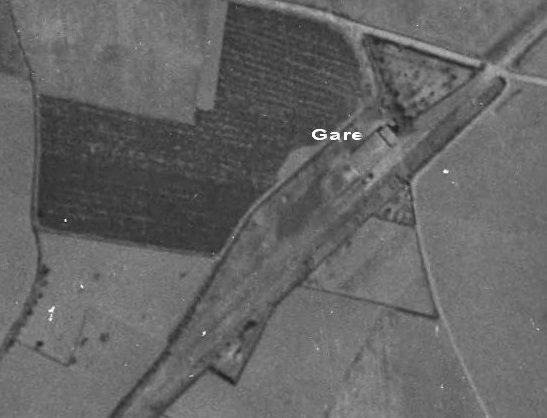 The two buildings feature quite prominently in the aerial photograph, just on the north side of the village. 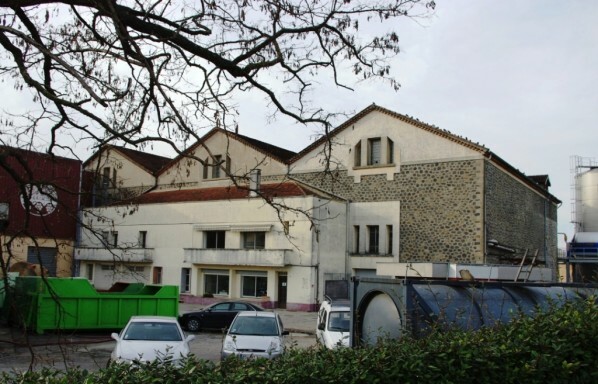 Boujan-sur-Libron Co-op. 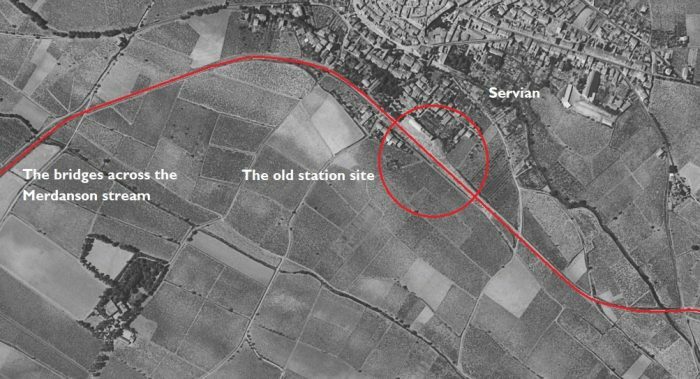 The site of the station in the early 21st Century. 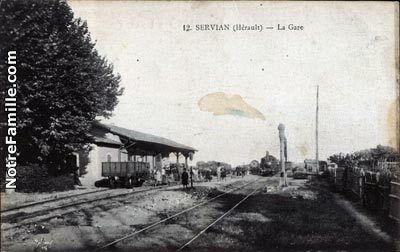 The buildings on the right are on the site of the old station building. 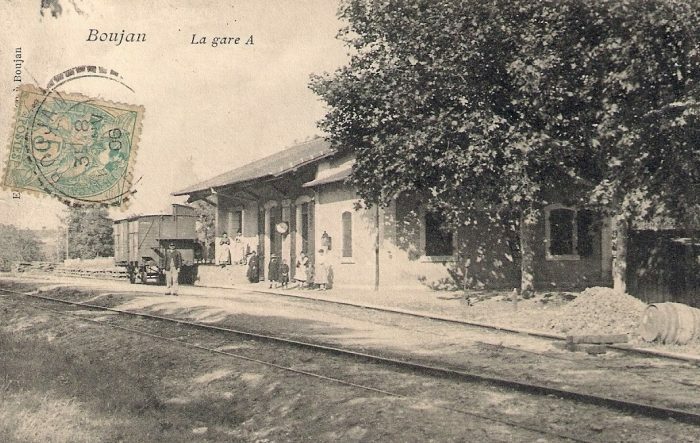 The road is named, ‘Le Chemin de la Ancienne Gare’. 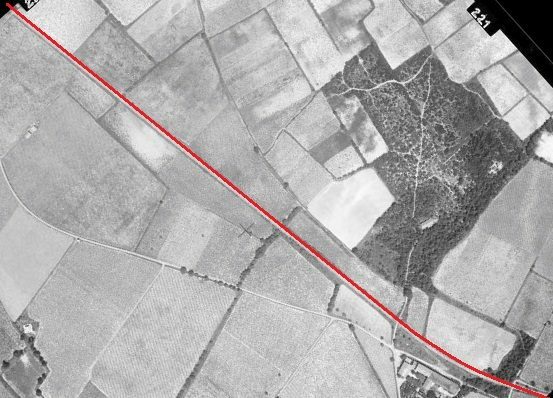 The route of the old railway has recently been improved as a short access road and then a walkway/ cycleway. 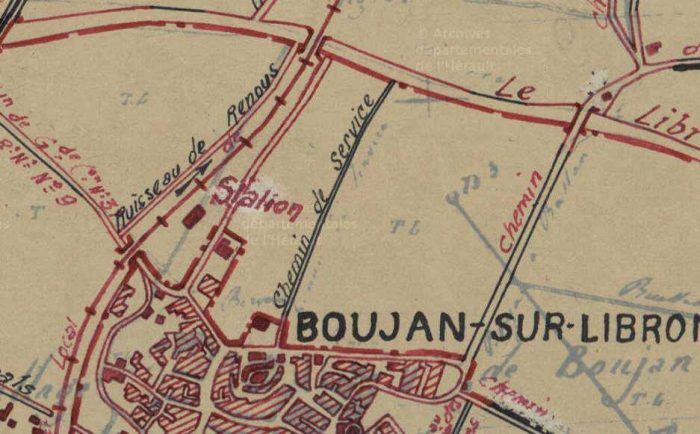 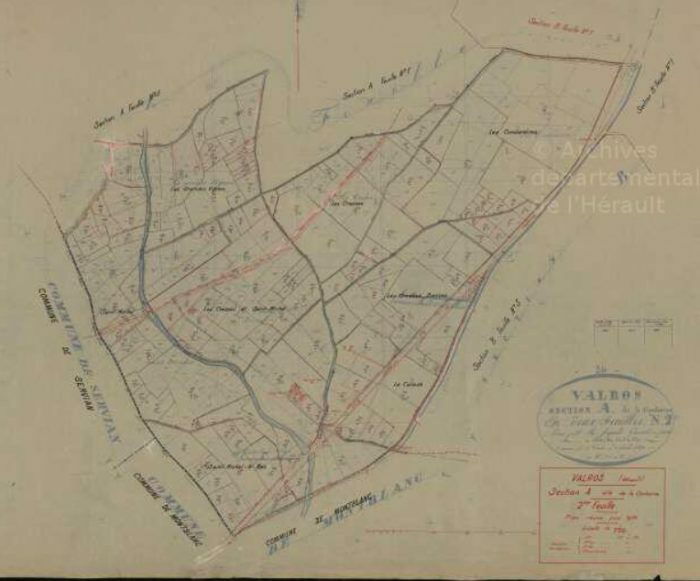 A hand drawn map of the village and station from the early 20th Century. 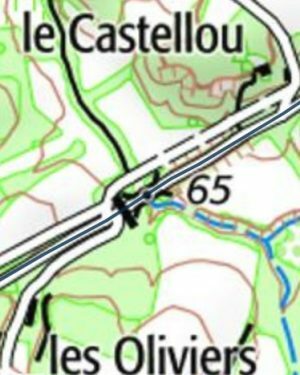 The cycleway is marked on the modern map by the lilac dashes. 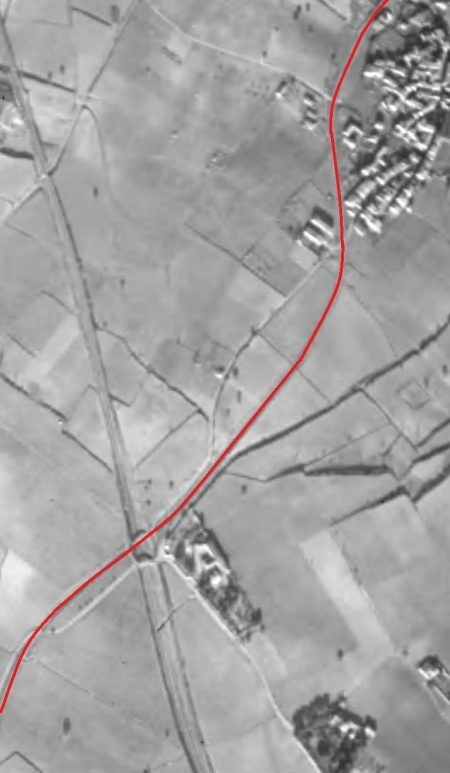 The old aerial image of the same area shows that this is the route of the railway. 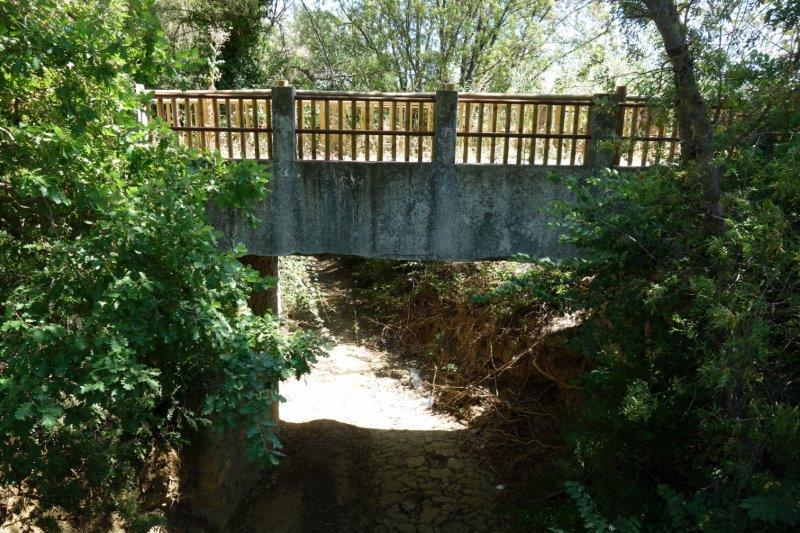 The bridge in the bottom of both images crosses the Libron River. 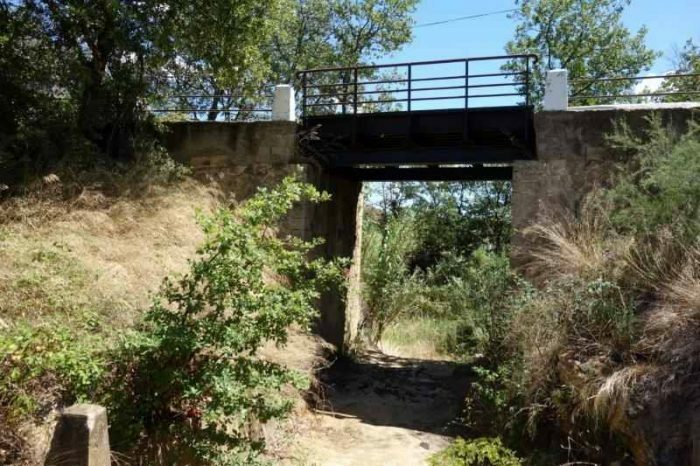 The bridge over the Libron River after the line has been converted to a greenway. 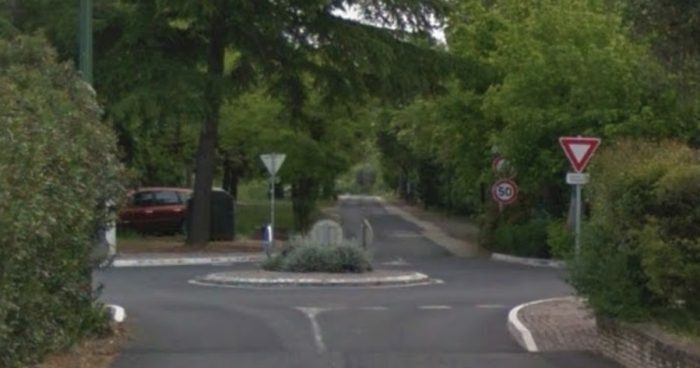 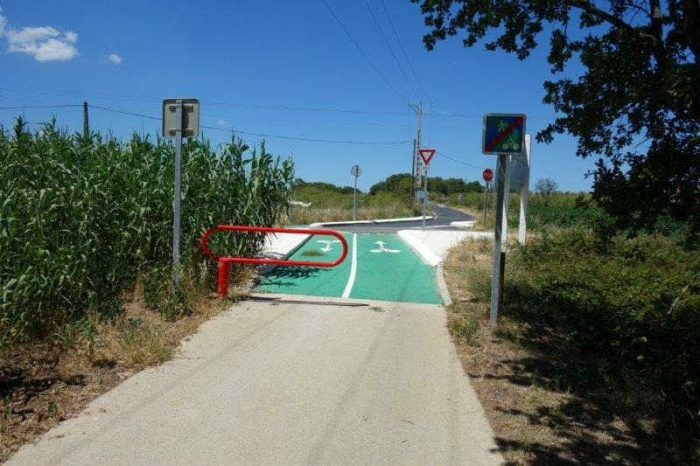 The new cycleway approaches a junction with the Route Guillaume-Thomas Raynal. 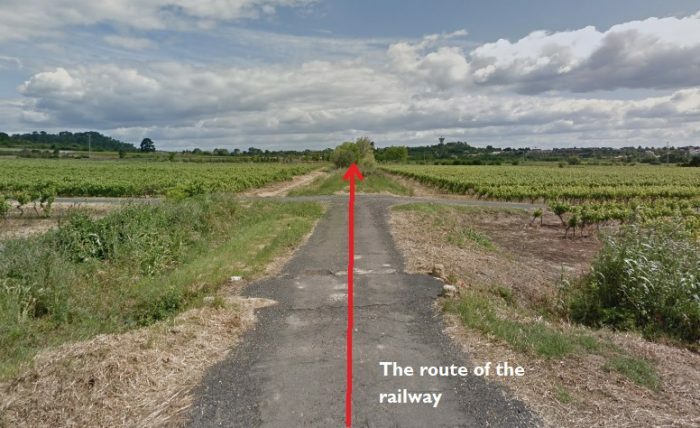 Looking back toward Boujan along what was the old railway from Route Guillaume-Thomas Raynal in 2013 just before work on the cycleway/greenway commenced. 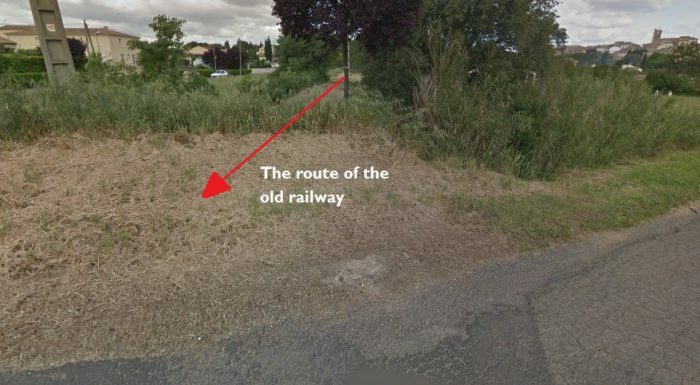 The picture above is taken looking forward along the route of the railway from the same location in 2013. 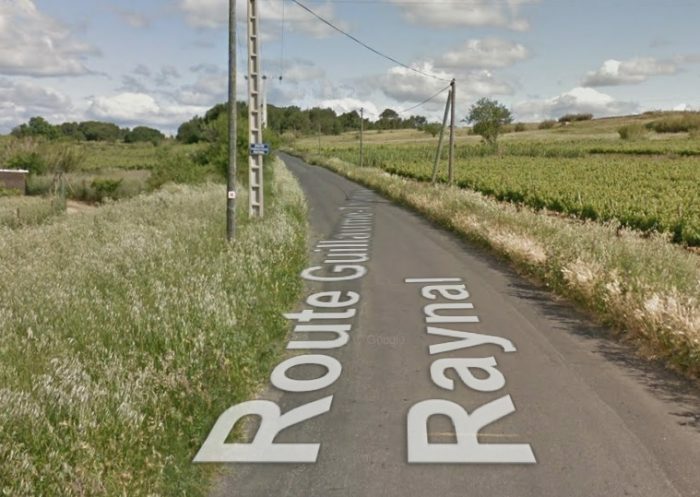 The old track-bed now forms the single-track road, Route Guillaume-Thomas Raynal. 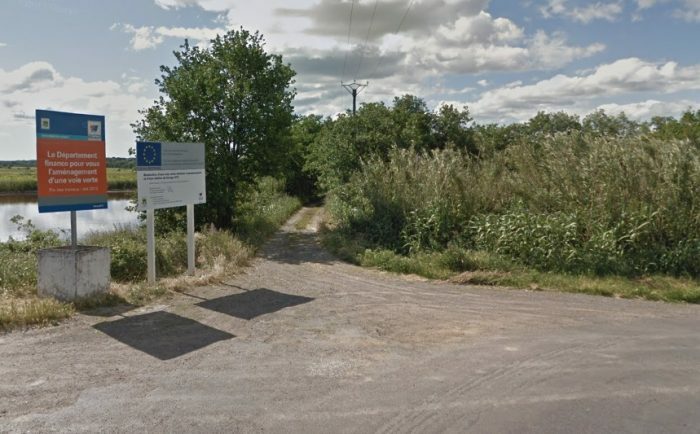 Both these images are taken from Google Streetview. 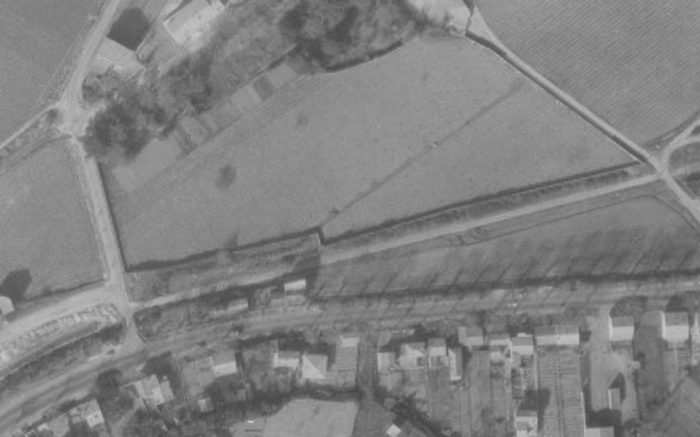 The aerial photograph below focusses on the station site. 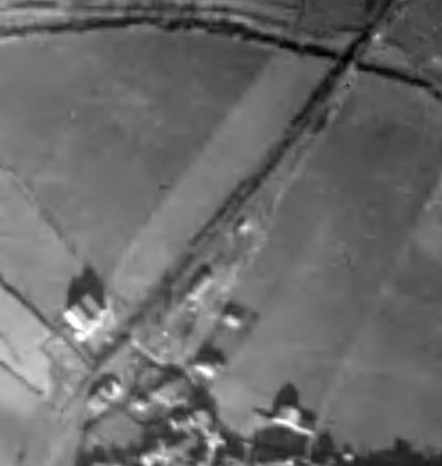 It was taken in 1944. 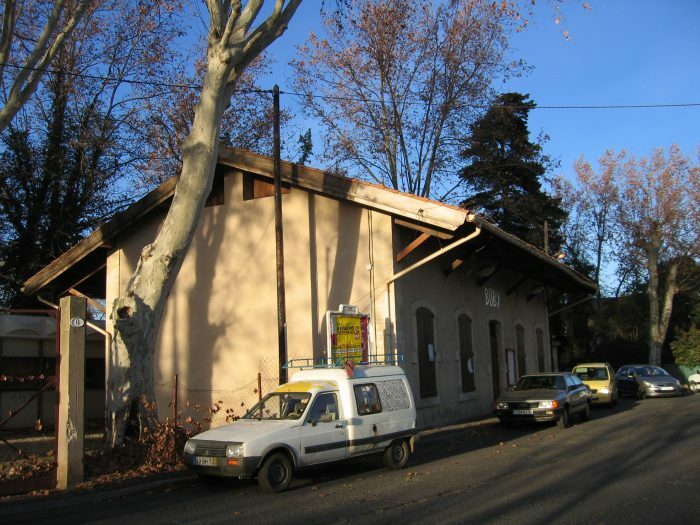 The next two pictures were taken in the early 21st century and show the station building which has been converted to a private home. 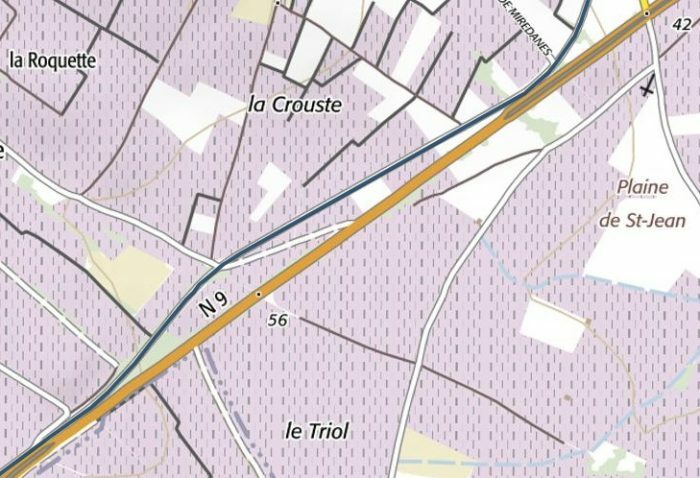 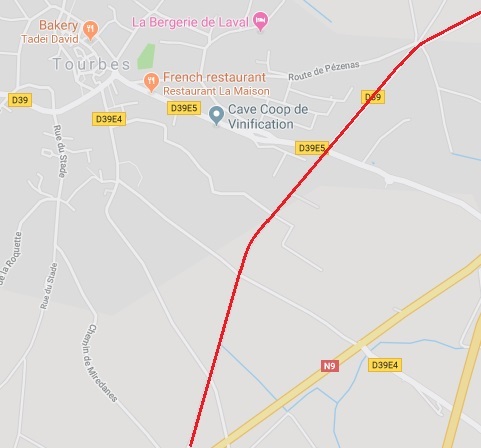 The railway route has been taken over by the D39 to the Northeast of the station in Tourbes. 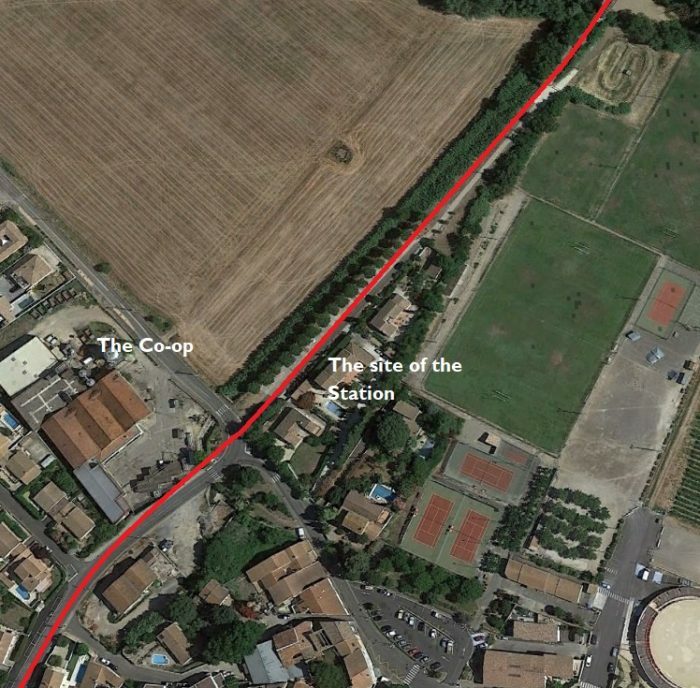 The two separate about a kilometre from the station. 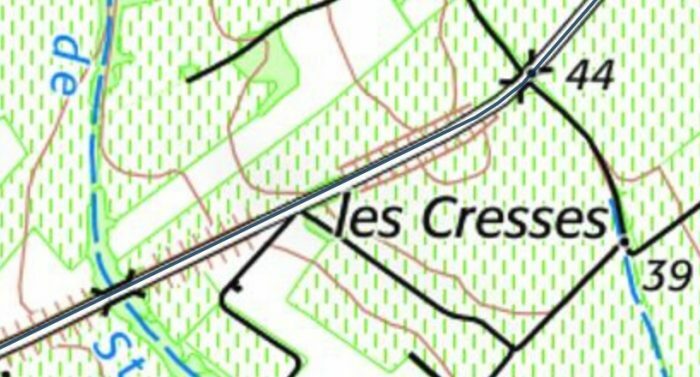 at the top of the images below. 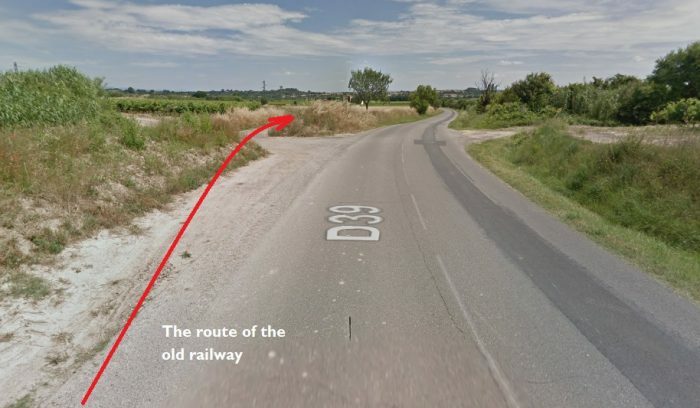 It is almost a surprise to find the railway route leaving the tarmac behind! 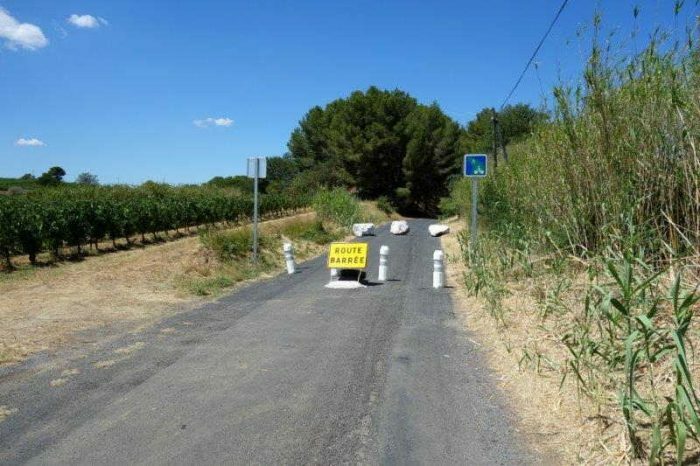 But it isn’t for long. 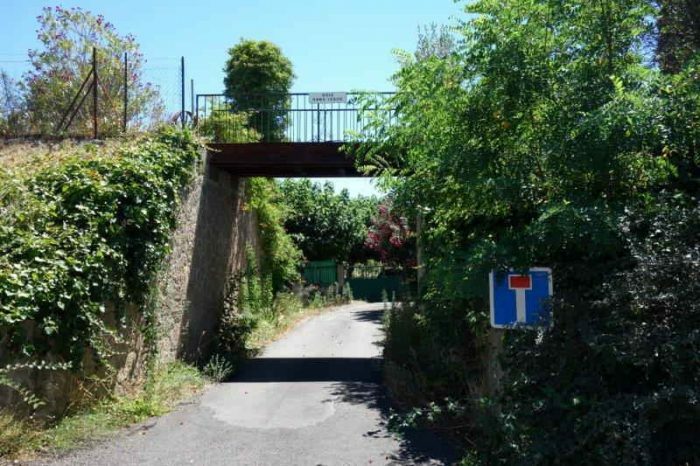 Just a few hundred meters along the track-bed it is back in use as a modern highway providing access to the local cemetery which is to the right of this picture which looks back down the line towards Tourbes. 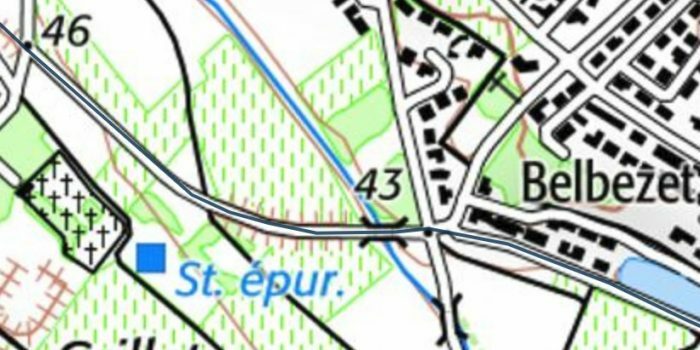 The cemetery can be seen easily on the map below. 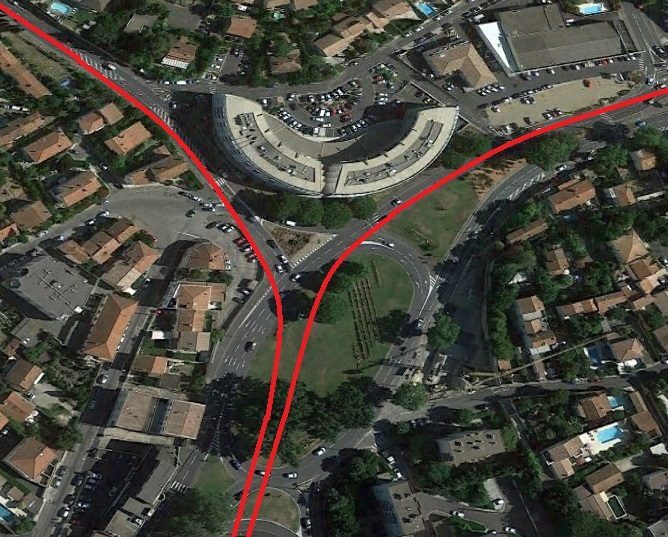 In the two images immediately above, the aerial photograph and the map, the old railway formation can be seen curving into Pezenas. 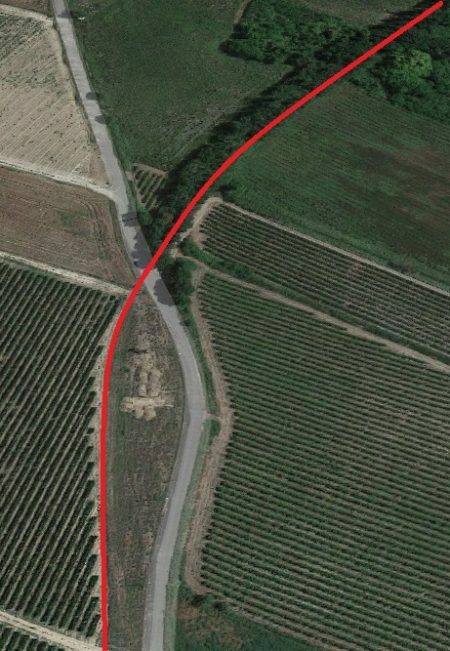 The first curve is described in the adjacent Google Maps Satellite image. 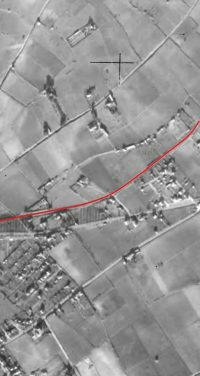 From this point the old railway gradually rose above the surrounding land on an embankment which allowed in to cross an accommodation road by means of a simply supported steel bridge which was at the location shown on the map below. 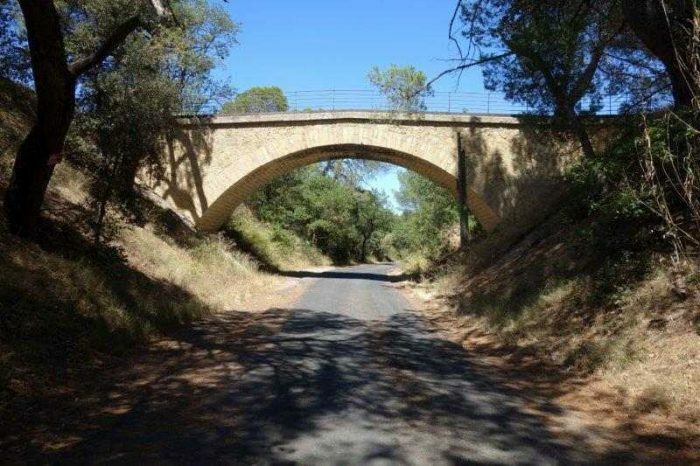 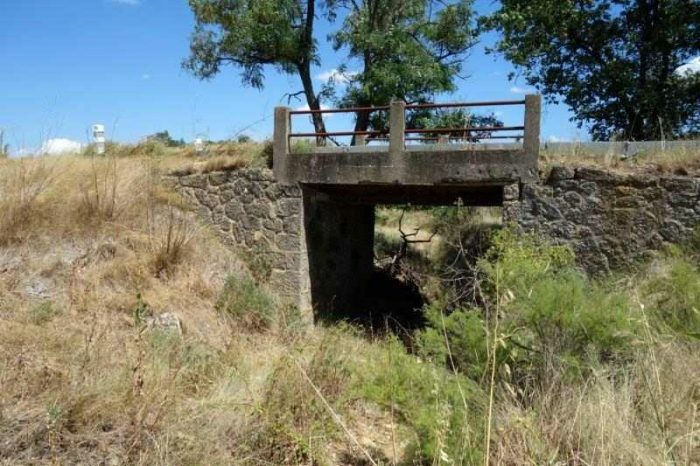 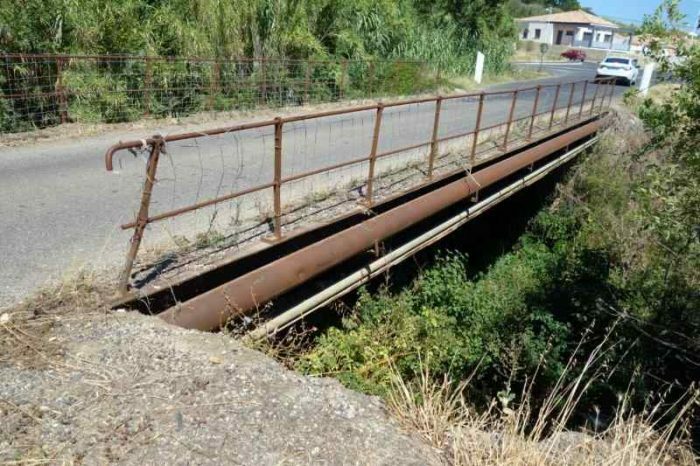 Steel girder bridge carrying the old railway over an accommodation road on the approach to Pezenas. 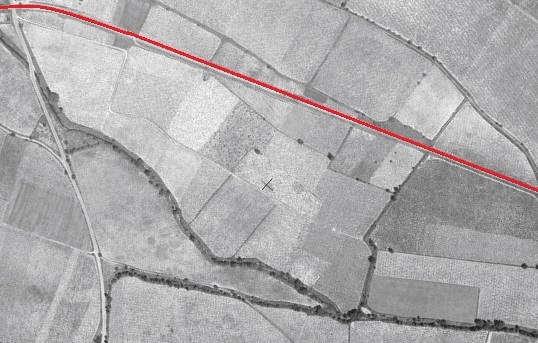 The original railway track-bed from this point on has been lost under modern development. 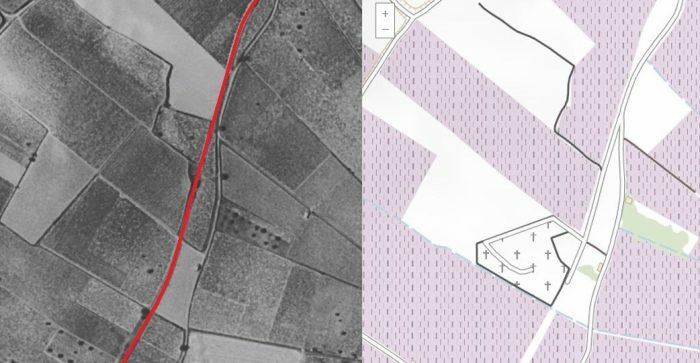 Both the D13 and new housing developments on both sides of the road have obliterated the original formation. 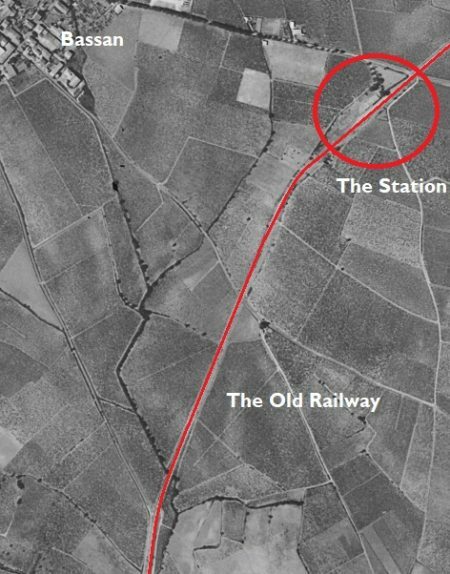 The approximate line of the old railway is shown above and below. 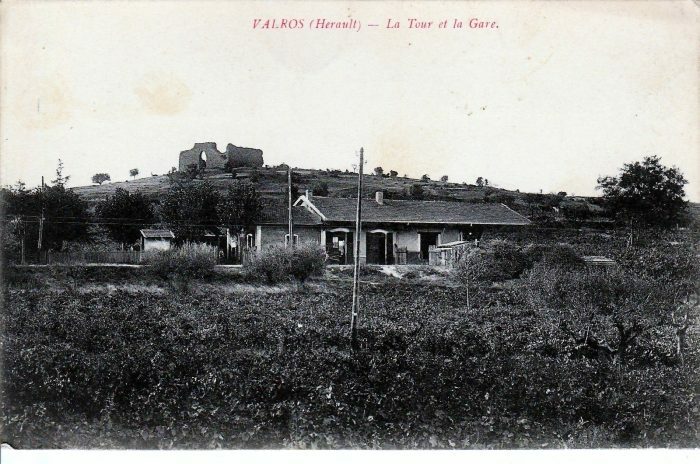 The station at Pezenas. 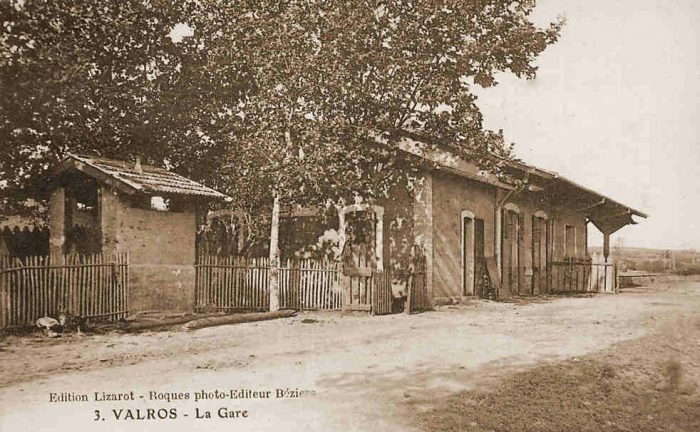 La Gare du Nord, Penezas. 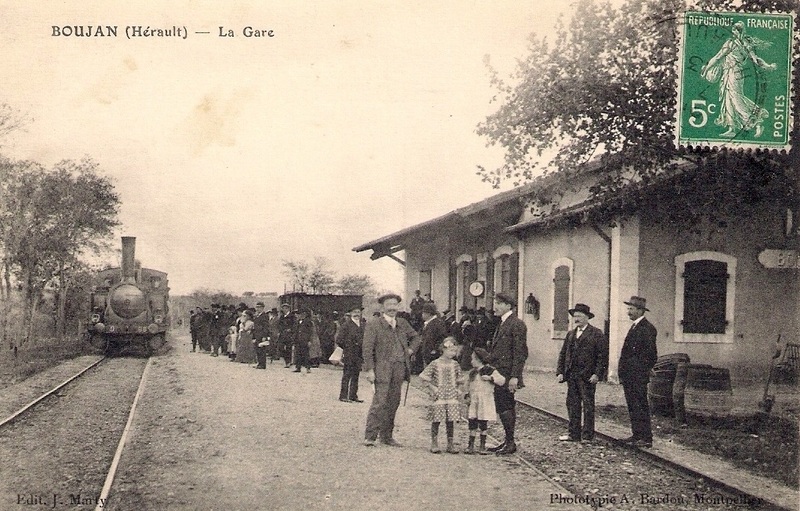 La Gare du Nord, Penezas. 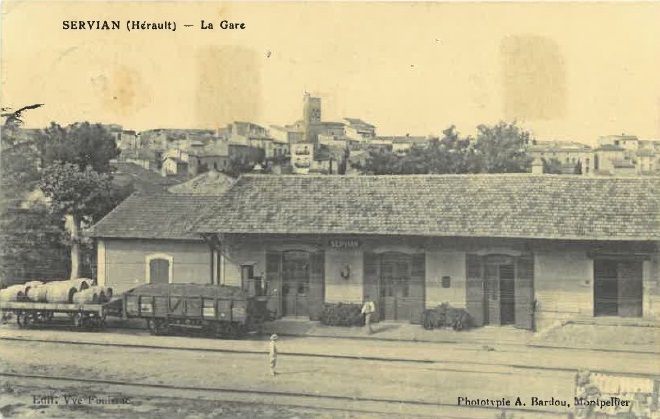 La Gare du Nord, Penezas. 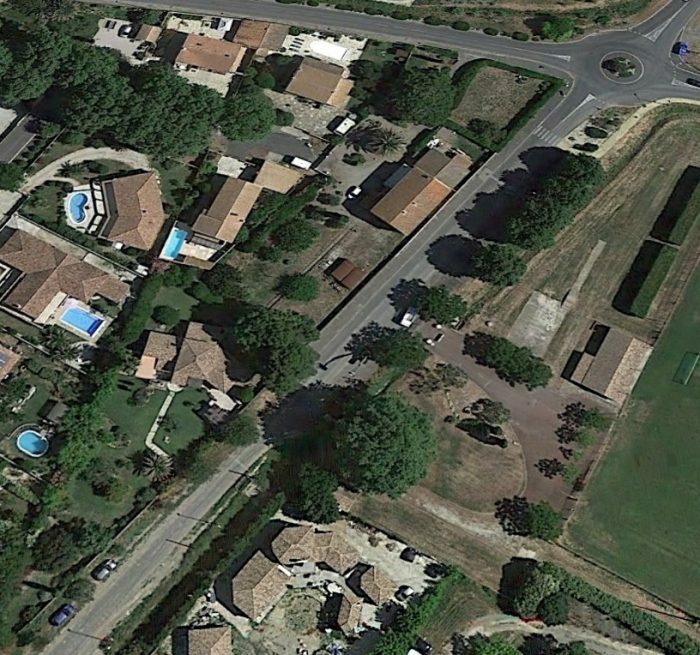 We finish this part of our journey here in Pezenas. 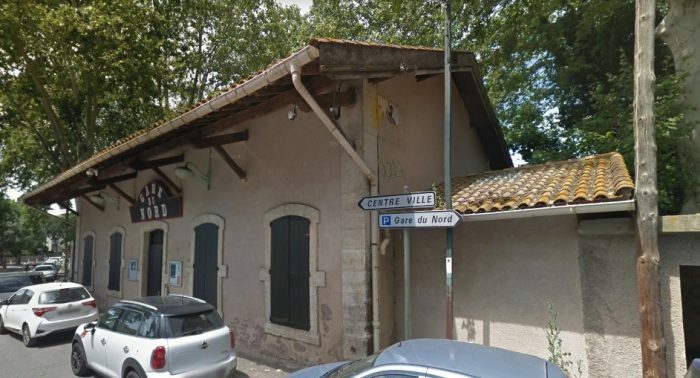 The nearest railway station is now at Agde. 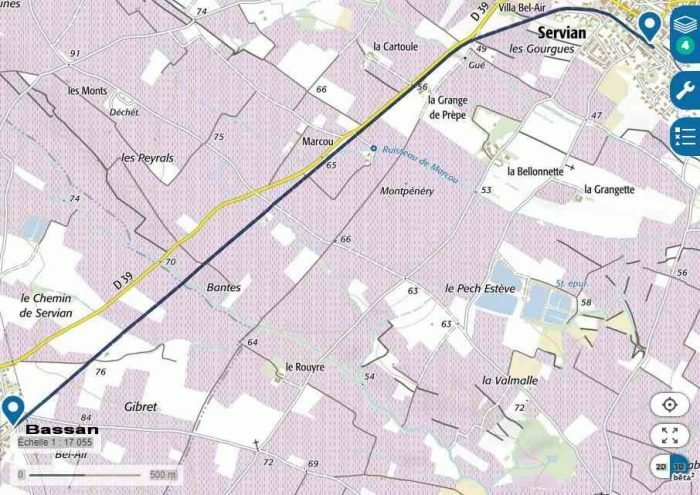 Two single track lines used to serve Pézenas. 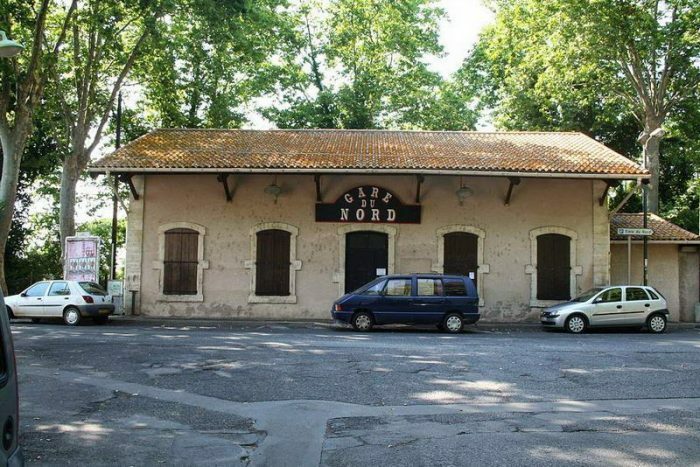 The track from Béziers has been removed, though the station (Gare du Nord) still exists as a cultural centre. 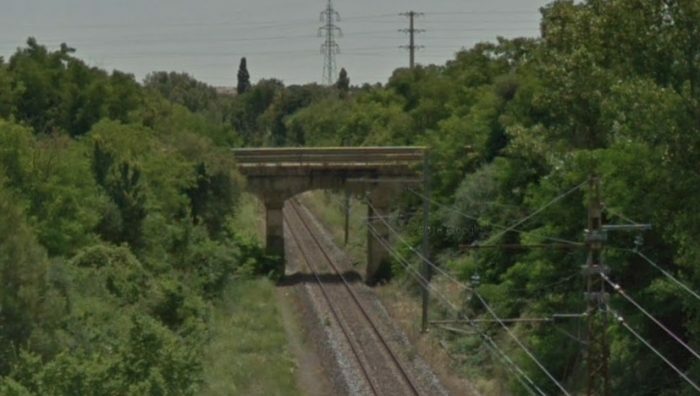 Although notionally still part of the national rail network, in reality the line from Vias, near Agde, is closed. 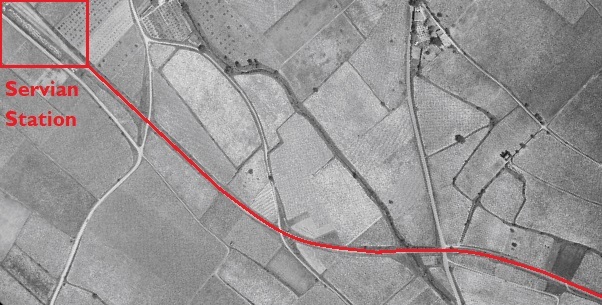 It was used into the 21st century by occasional freight trains serving a quarry further north. 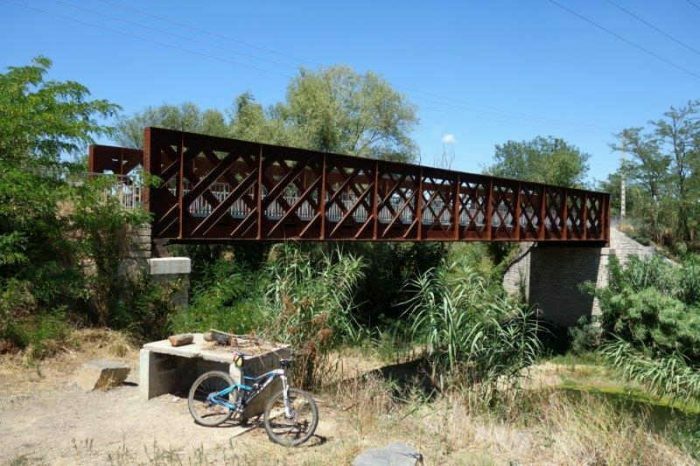 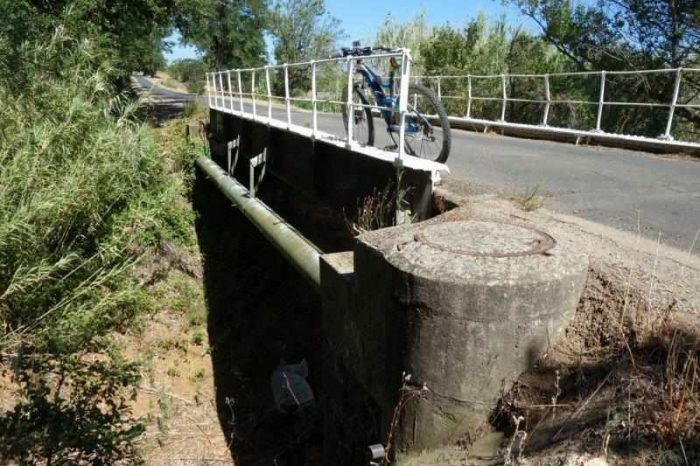 Since at least 2011, a section at St Thibéry, some five miles (8.0 km) to the south of Pézenas, is in use as a ‘Pedalorail’ leisure facility. 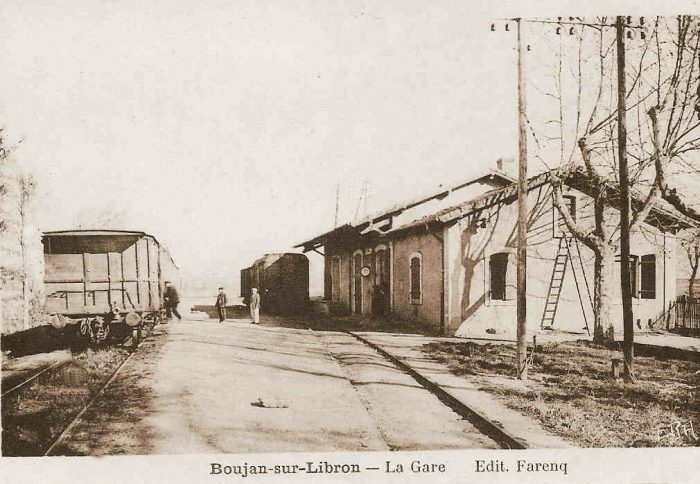 However, the track remains in place throughout and the Gare du Midi is extant and in use as a medical centre. 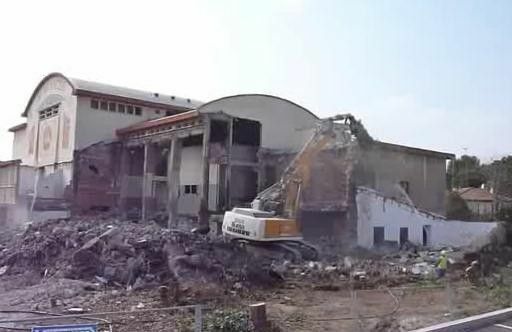 https://remonterletemps.ign.fr, accessed on 22nd March 2019.
http://www.centerblog.net/journal-intime/15183-6569317-deconstruction-de-la-cave-cooperative-de-beziers-, accessed on 22nd March 2019.
http://passes-montagnes.fr/htlm1/vf_interet_local-10.html, accessed on 25th March 2019.
https://www.geneanet.org/cartes-postales/search/?country=FRA&go=1&page=1&place=Boujan-sur-Libron&region=LRO&size=40&subregion=F34&zonegeo=H%C3%A9rault%2C+France, accessed on 24th March 2019.
http://www.cavescooperatives.fr/article-boujan-sur-libron-herault-102598516.html, accessed on 25th March 2019.
passes-montagnes.fr/htlm1/vf_interet_local-11.html, accessed on 25th March 2019.
http://archives-pierresvives.herault.fr/ark:/37279/vta5599beff9fbd5/dao/0#id:1600875409?gallery=true&brightness=100.00, accessed on 25th March 2019.
http://passes-montagnes.fr/htlm1/vf_interet_local-12.html, accessed on 25th March 2019.
https://magalas-ensemble.fr/jadis-chemin-de-fer-de-1900, accessed on 25th March 2019.
https://www.communes.com/ville-servian, accessed on 25th March 2019.
http://passes-montagnes.fr/htlm1/vf_interet_local-13.html, accessed on 25th March 2019.
https://www.geneanet.org/cartes-postales/view/7421958#0, accessed on 25th March. 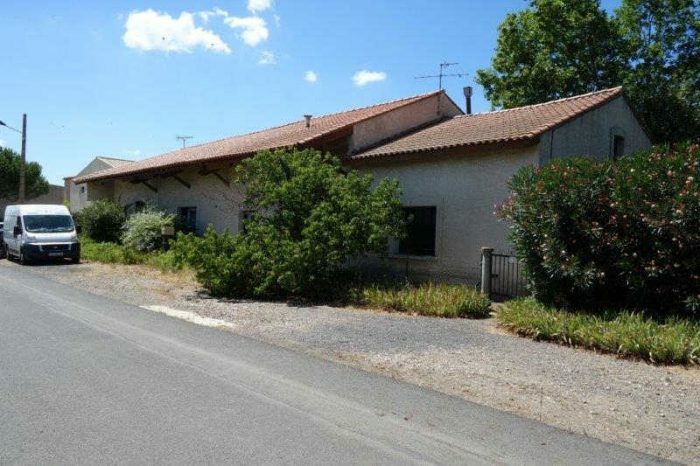 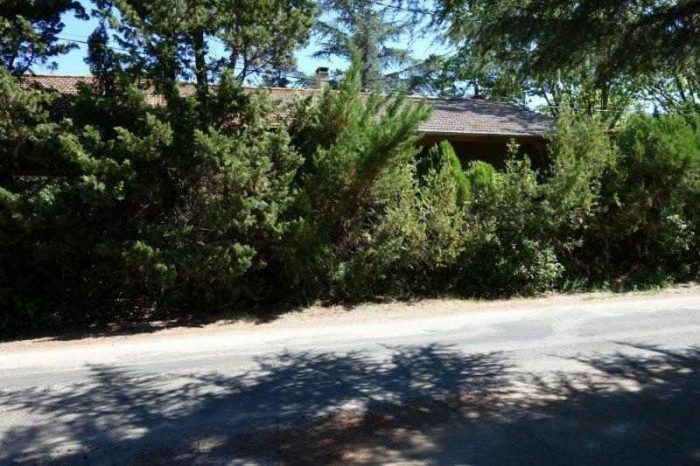 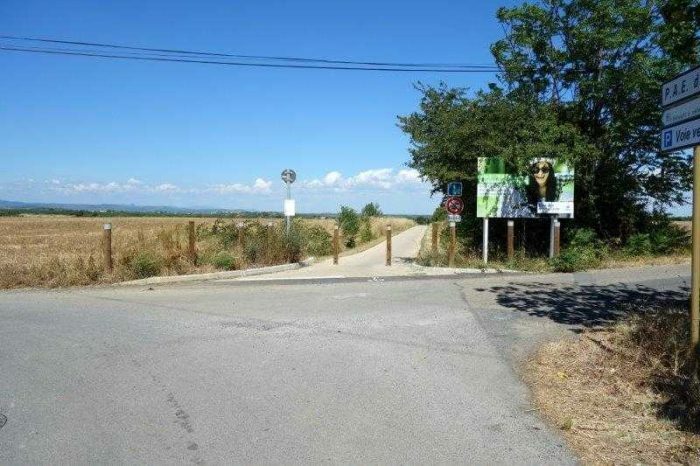 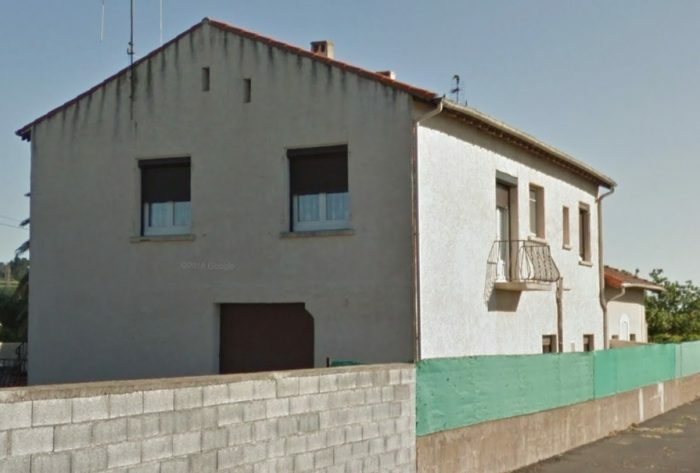 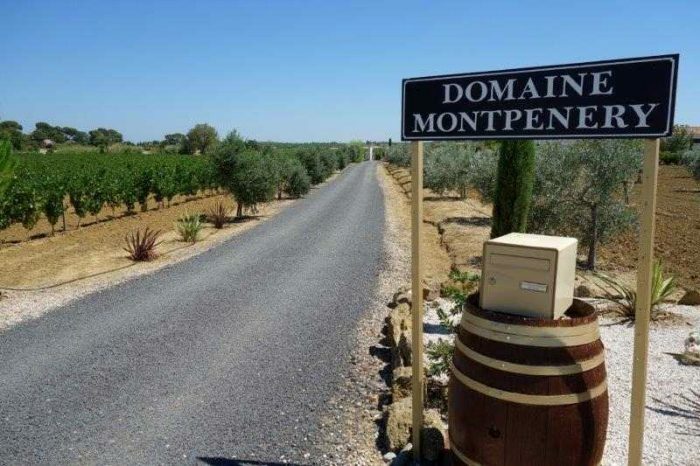 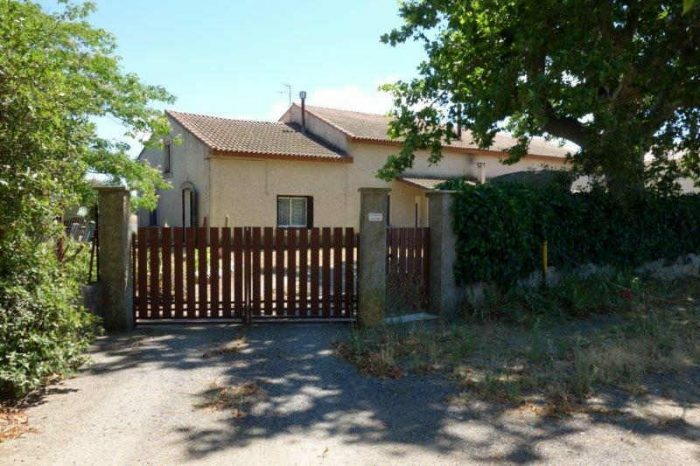 http://archives-pierresvives.herault.fr/ark:/37279/vta5599bfd8541be/dao/0#id:585155917?gallery=true, accessed on 26th March 2019.
http://passes-montagnes.fr/htlm1/vf_interet_local-14.html, accessed on 26th March 2019.
http://passes-montagnes.fr/htlm1/vf_interet_local-15.html, accessed on 26th March 2019.
http://www.idherault.tv/35330/la-gare-du-nord-pezenas, accessed on 26th March 2019.
https://fr.wikipedia.org/wiki/Fichier:Chemins_de_fer_de_l%27H%C3%A9rault_-_P%C3%A9zenas_gare_c%C3%B4t%C3%A9_cour.jpg, accessed on 26th March 2019. 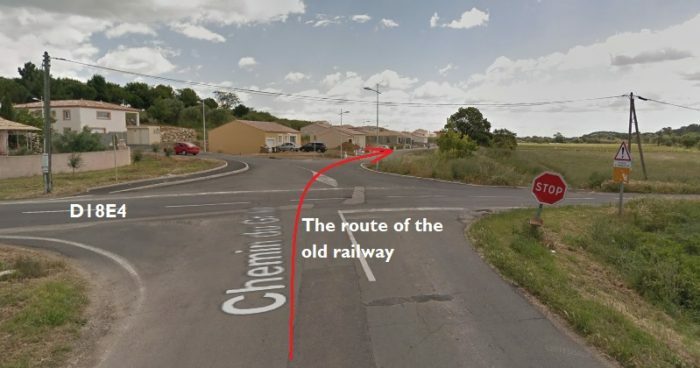 This entry was posted in Railways and Tramways of South-Western France, Railways Blog on March 26, 2019 by rogerfarnworth.